CILIP’s Information Literacy Group have produced a great set of research sheets aimed at schools, and even better, they have chosen to allow this as a free download for everyone. They were originally created to go with the Teen Tech Awards, but they adapted them for use in all settings. These ten sheets help students become information literate and smart researchers themselves. Download them here. CILIPILG has also produced a very helpful new definition of what Information Literacy means in all sorts of contexts, and you can download that here. It’s the time of year when inductions start happening for new students, or we start thinking about how we introduce the library to our incoming Year 7 students. This introduction is from Matt Imrie, blogger at Teen Librarian. If you haven’t yet discovered this wonderful resource, then sign up today! Matt has created one of the best fun introductions to Dewey – in my opinion! 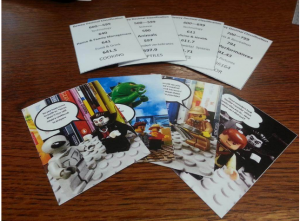 – with this fun activity using the Dewey Decimal Classification card game. Playable in several ways, Matt provides the rules and a free download of beautifully visual cards. Feel free to use this resource – but remember to credit the Teen Librarian! If you have any great induction activities you’d like to share, please contact me. 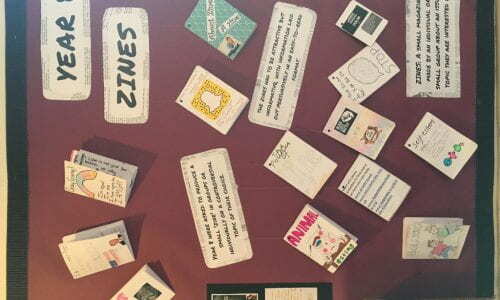 We looked some example zines I’d printed and compared zines to magazines before choosing a zine to pull apart. We looked at how clear the message was, use of images to inform and entice readers and how persuasive they were. For homework the girls had to decide groups and pick a topic to focus their zine on. 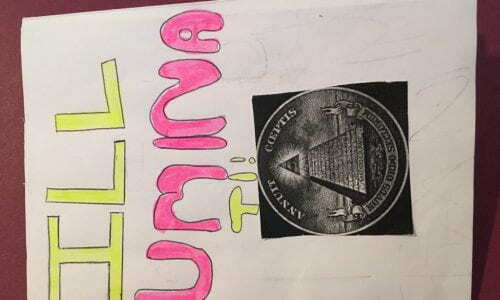 Then we spent a lesson focussing on how to make a zine, using a zine about making zines from the Umamu Design Blog. 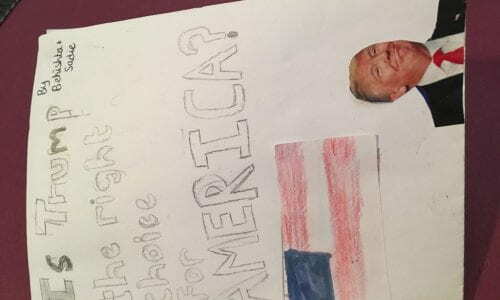 Students were then encouraged to make a mock-up and decide on content for each page. 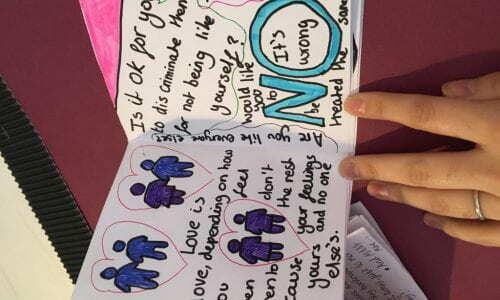 In the final lesson all the zines were brought in and we gave feedback on each other’s work based on how attractive they were, how well laid out information was and how clear and persuasive the message was. I was surprised by the quality of the work and the originality of some of the ideas! 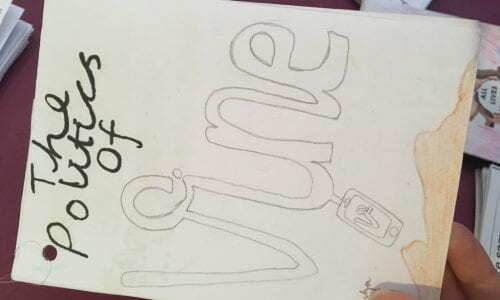 There was also a real journey from the students not knowing what a zine was at all, and being very confused in some cases, to creating amazing and expressive zines of their own. Definitely a recommended activity, especially if you have time to include some information credibility and plagiarism in there too. Valerie Dewhurst, Librarian at QEGS Blackburn recently made her first step in to moving her information literacy lessons online. Her school has moved to Google Classroom, and she emailed me about her first online lesson. 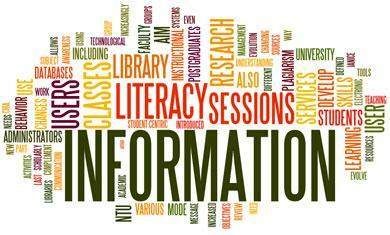 Firstly my main priority was to make sure students know just exactly what Information Literacy actually means/covers ….. So students are being well-informed as I go on to explain that IL is a set of abilities requiring individuals to recognise when information is needed, and have the ability to locate, evaluate, and use effectively the needed information. This initial breakdown has worked well, and is getting us off to a really good start. It’s been a while coming but finally I have managed to upload my IL resources to Google Classroom, and start to deliver these to my Yr 7, 8 and 9 during library lessons. My main concern for speeding up with this move was because I could see our students drowning in information, and misinformation. Information Literacy skills to my knowledge are not tested in schools – so teaching IL has never been more important. However, as all librarians are fully aware teaching IL is just not that straight forward; lack of library contact time with students or lack of our own confidence in teaching these skills. I was prepared to upload my existing resources to Google Classroom because I wanted to continue teaching IL skills but in a more up-to-date way, in-keeping with how many subjects now teach in my school. I also at the same time wanted to deliver these critical, all-important information skills in ways that would capture and hold our student’s interest. We all know how quickly some students can switch off – so being prepared for this is much needed. I purposely waited until students were familiar with the system – it was introduced here in 2015. I was indeed apprehensive to start with – but now feel there is no going back. I have attended twilight training in school – and very much wish to keep this training up. 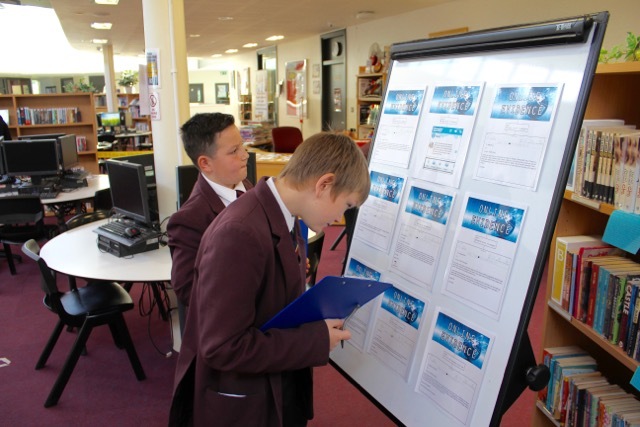 Pupils work through the uploaded tasks at their own pace – I am aiming for two tasks to be completed per lesson as Accelerated Reader takes priority. 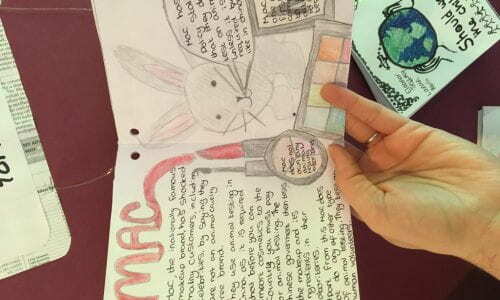 Pupils can access from home and work through more tasks if they so wish – many Year 9 students have requested to do this. What I have recently found is that when students are logging into Google Classroom to complete homework for subjects some are actually logging into the IL section too – completing a few tasks. So I need to speed up uploading my resources as students are working at a pace far greater than I imagined. Finding resources – such as databases, documentary films, Web sites, print sources etc. 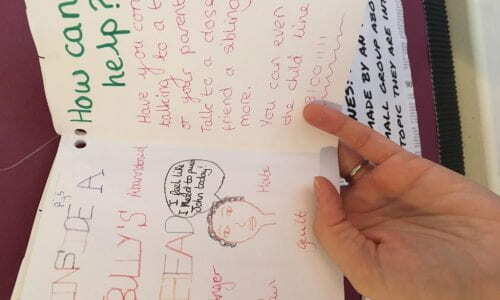 Evaluating the resources and thinking about them – Who made the message and why? What is left out of the message? 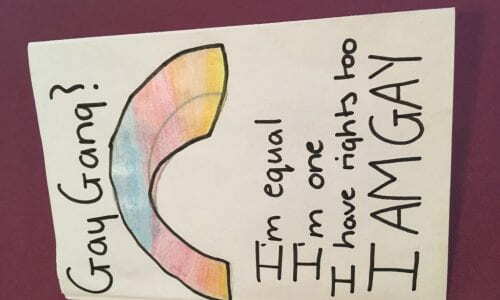 How might others view the message differently? Expressing the information learned in meaningful ways – e.g. student produced podcasts, wikis etc. Following on from Information Literacy I also intend to upload many Library & Research Skills – with much work featured on Dewey. I am amazed at the excitement, engagement, and collaborative working students have show using these resources. I have asked if students would like to see anything in particular uploaded – requests are already coming in, more Dewey is a popular request. There are still some hands on tasks – even using Google Classroom you can still maintain this. Tasks are easy to modify and upload. Students comment/answer on your set tasks – as a librarian delivering these tasks you can see the results. You can give feedback – you can instantly reply. You can differentiate your groups – you can start small and aim high. You can upload short YouTube videos, Dewey game links, it’s your choice – you are the creator. You can add tasks or full on assignments. I am slowly adding over 11 years of Information Literacy/Library Skills etc – while adding I am also updating them, which can only be a good thing. There are a multitude of skills I want to teach – this is giving me the opportunity to do so while not taking up too much time – plus just think how much I am saving on paper and ink! Now that I have received some comments back/work completed I have started to look over students answers and I am amazed, delighted – proud. I couldn’t have expected anything more. 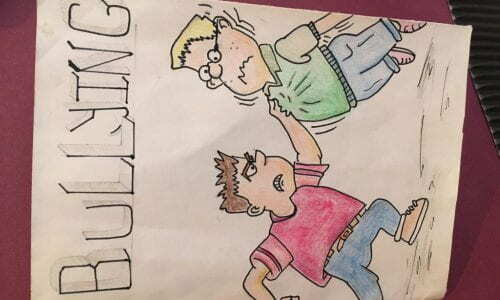 There is no excuse for students to be bored – there is always something for students to move onto – this is your area, these are your tasks, your teaching. 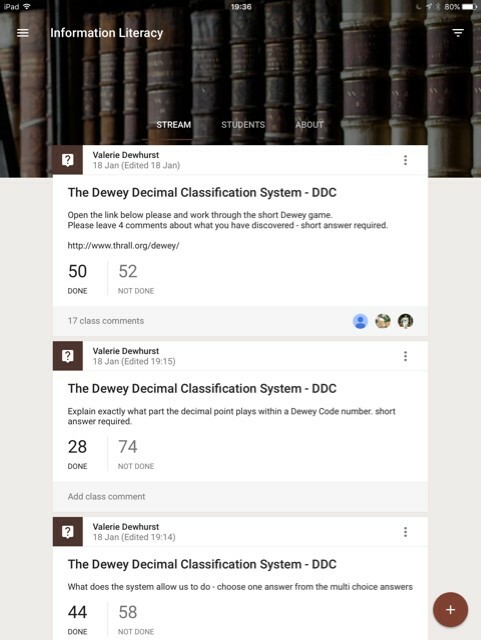 Google Classroom is also convenient if you ever need your group to be covered – cover work set would be to work through IL tasks on GC – just remember to have lots uploaded, and tell your students that you have high expectations of their answers. I must thank the SLA website for their very detailed schemes of work – which have helped me in my own work. Don’t forget you as a librarian can take the IL course with the SLA – just to get yourself up to scratch, and feeling a little more confident when delivering your sessions. Hoping others start to make the switch too, and enjoy the freedom of teaching online. 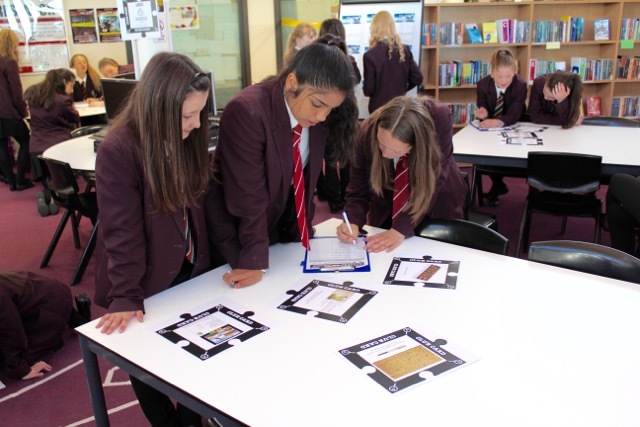 On Monday 4th July, KS3 students at Abraham Darby Academy, Telford, were presented with an unusual library-based activity: solving the mysterious murder of a librarian’s assistant! 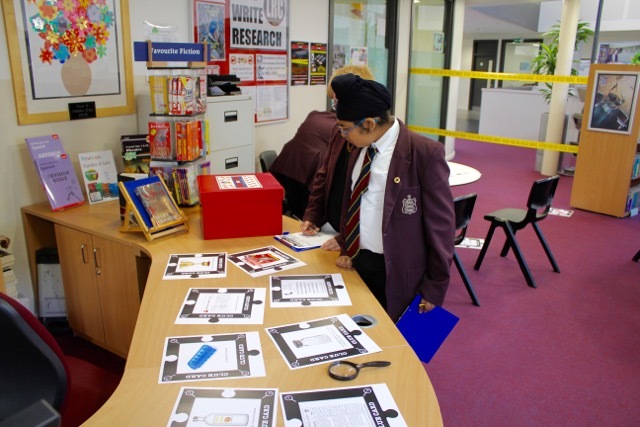 Run as a competition to help students develop both group and individual oracy skills, ‘Murder by the Book’ challenged student teams to visit a crime scene set up in the library, investigate 44 different clues within a set time limit and work together to uncover the truth. After completing their warm-up detective exams, teams spread out across the library to discover, deduce and determine. all the clues had to be carefully examined, recorded and cross-referenced. After visiting the crime scene, teams were then given time to pool their ideas and formulate theories as to who did it, why, how and also how the remaining two suspects could be proven innocent. The activity culminated with each team presenting their findings before a ‘judge’. Individual team members were tasked with explaining certain sections of their case and marks were awarded for the clarity of their presentations, along with the number of clues accurately explained. After the winning team was selected and awarded their certificates, the murderess revealed herself and the whole solution was presented. All students involved were fully engaged with the activity and the complexity of the case generated some lively discussions and resulting presentations. Produced by Box Clever Education, ‘Murder by the Book’ is a unique murder mystery kit designed to help KS3/4 students develop literacy and employability skills. If you think a murder mystery would appeal to your students and would like to find out more, please visit http://www.boxclevereducation.com. For a unique opportunity to see the game in action on a training day in a school in SE London, then book on to this CILIPSLG Training day which takes place on 24th October 2016.